Striker Jason joined Watford from Nottingham Forest in 1997 and spent just over one season with the club, scoring 11 goals including the winner at Fulham which clinched the Division Two title. He left to join Chesterfield. Now working with the PFA, Jason spoke to Watford Legends in 2009. Hi Jason. How did you become a Hornet? I was coming to the end of my contract with Forest, and had been on loan with Charlton and Grimsby. Graham Taylor, who had been watching me that season got in touch and asked if I would be interested in joining Watford. Was it an easy decision to make? I had a good chat with Graham and he was very persuasive and he showed me around the place. My reservation was that I was going to be dropping down a division but Graham was very confident that it would only be a short time before we were back in the Championship. I though that I would like to be a part of that. It was a good season as we finished Champions. We remember your volley against Wycombe and the all important winner against Fulham on the last day. I was delighted with the Wycombe goal. I don’t get many like that so it was a good to get that one. I actually think that my first goal for the club was better for me as it got me off and running. And of course the goal at Fulham was great as it finished the season. Who were your best team mates at the time? Tommy Mooney was and is a good friend, and we knew each other from Southend. How did you get on with the fans? Very well. I think they took to me and I enjoyed playing in front of them. I think it helped that I got off to a good start in front of goal. But it was just one season for us as you moved on. Yeah I think me not moving down to the area was a sticking point with Graham. I was able to stay with family and friends in London, but it’s not the same as living here. I was very unsure about moving all my children away from school and buying a house in the south. So that was why I did not move. My career has taken me all around the country, and I have settled in Nottingham because for whatever I do in the rest of my career, it is a central place to be based. Did you fall out with Graham Taylor over this issue? No we didn’t fall out; we were both professional about it. He had his principles which I understand. He wanted his players to live in the area. I was as committed as I could be but I just couldn’t move down. You’ve had a lot of clubs in your career. How did GT fare as a manager? I enjoyed working for him. He was very demanding of his players. I took a lot of what he said on board. I was in good shape when I played for Watford and I think that it has helped me play on for as long as I have in my career. Which of your clubs did you enjoy playing for the most? 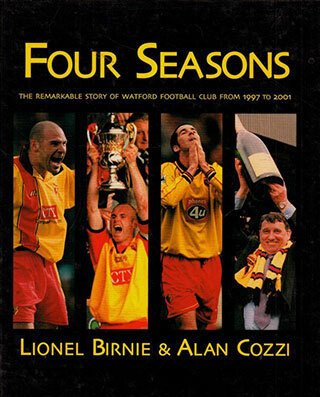 I enjoyed Watford for the simple fact we were successful. The same with Peterborough. I enjoyed playing for Forest as we were in the Premier. I enjoyed Charlton also as it was my first club and everything was new to me. I also enjoyed Southend as at the time we exceeded all expectations. You are now coming to the end of your football career. What are you looking to do in the future? I am doing a bit of coaching as well as a degree in sports journalism. I want to do something in one of them fields. If we rang you in five years time what would you be doing? I’d be doing nothing and probably be on a beach. But really I don’t know which way I will go. Both ways interest me. I’m doing everything I can to make either of these things happen. Well thanks for talking to us and good luck – with whatever you do!